Why Was Poland the Only EU Country to Avoid Recession? 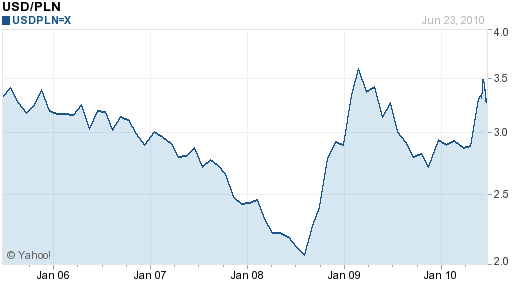 HomeBusinessWhy Was Poland the Only EU Country to Avoid Recession? 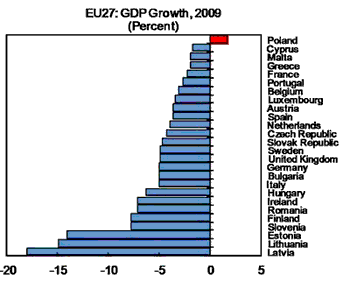 Poland is the only country in the European Union which did not have a recession during 2009, as shown in this chart. And among all the OECD countries, Poland had the best real growth performance in 2009. I visited Poland this past week to give some talks and to better understand Poland’s resiliency. One particularly enjoyable talk was joint with Leszek Balcerowicz the former central bank governor and finance minister who deserves much of the credit for transforming Poland’s economy from central planning to a market economy back in 1989. What are the reasons for Poland’s extraordinary performance in 2009? Good economic policy had much to do with it. As with some other emerging market economies Poland was in a much better macroeconomic position in 2009 than it was 10 years ago. It kept its inflation rate and its debt levels low, limited its borrowing in foreign currencies, and accumulated a large amount of foreign reserves. It also did not overact to the financial crisis, despite urging of many inside and outside of Poland to do more to stimulate the economy with discretionary fiscal policy. By not overacting it prevented the kind of panic seen in other countries. Some say that the flexible exchange rate was a factor in avoiding recession as the depreciation of the Zloty helped keep net exports from declining as sharply as in other countries. However, the Zloty appreciated before the crisis which would have had negative effects, and the subsequent depreciation essentially took the exchange rate back to about where it was before that appreciation, as shown in the second chart. While Poland still needs to be vigilant and keep its government debt from rising as a share of GDP, it is currently in far better shape than other countries according IMF data on debt, including the United States. 1 Comment on Why Was Poland the Only EU Country to Avoid Recession? Poland was also virtually the only country to refuse to buy the flu vaccine last winter, stating that the facts did not warrant this. Fortunately, political correctness has not yet embedded itself in Poland-one of the last islands of individualism and personal freedom. Thats what Poland fought for during the last 200 years. We are not about to give this up in the name of political correctness. Let other countries look at political correctness (and one its instruments-the war on terrorism)as what it really has become-an attack on self confidence and personal freedom.